By Sunday, the fourth and final day of the festival, the Manchester, Tenn., farm was ripe with aromas of the most pungent variety. Victimized by the remnants of Hurricane Arlene, the festival grounds were now an unsavory combination of baked mud, hay and half-eaten corn dogs. And it didn’t help that most of the festival-goers hadn’t showered in four days (and that it had been much longer for some of the more—how should we say it?—“natural” denizens on hand). Combine that with the estimated 75,000 residents of this long-weekend tent city, coexisting without any proper plumbing aside from the battered portable toilets, and one was faced with an olfactory concoction that made even the most resolute patchouli enthusiast shudder. But Bonnaroo sounded much better than it smelled. Try as you like, writing about the festival without making hippie allusions is all but impossible, even with a lineup as noticeably low on jambands as Sunday’s schedule. From the tie-dyed baby boomer armed with a children’s bubble-maker gun to the countless hemp vendors, Bonnaroo is clearly a crunchy affair. A rendezvous with De La Soul that lasted into the early morning hours kept most of the Paste staff on the rock-star sleeping schedule, rising just before the crack of noon. So, while the shuteye kept us from catching much of The Old 97’s anticipated midday set, we arrived just in time for Matisyahu’s show at This Tent. Dubbed the “Hasidic Reggae Superstar,” Matisyahu may be the only Hasidic reggae star, but don’t take that to mean he’s any less deserving of the superlative, as his live show proves. Born Marcus Miller, Matisyahu was at home with the jamband throngs, a group he once belonged to. Backed by a solid band that indulged itself with only minor forays into obligatory jam territory, the Brooklyn resident’s set brilliantly mixed the hip-hop sensibilities of his keen vocal delivery—singing, rapping and beatboxing—with purist reggae. Later in the afternoon some of the Paste staffers bumped into Matisyahu reading scripture before his performance on the Sonic Stage, proving his commitment to Judaism is all faith and no gimmick. Both of his sets were warmly received by the Bonnaroo audience, assuring that his hype wave—which first emerged at South by Southwest in March—has not yet crested. After hawking magazines for a few hours, the entire Paste booth, in one of our wiser moves, essentially shut down for the My Morning Jacket show on Which Stage. Making its third consecutive appearance at the festival, the Louisville, Ky., group is one the few bands (along with Flaming Lips) to be gaining as much headway with indie-rock scenesters as jam-addicted hippies. In spite of all this, the neo-psychedelic Southern rockers spun another grand show via their reverb-happy palette. Churning through songs from their latest full-length It Still Moves, the band added a theatrical element to the set, bringing larger-than-life puppets on stage, one after each song, until George Washington, a giraffe, what might’ve been a cockroach, a giant Polynesian icon and some other human-looking character were all quirkily dancing onstage. On top of this, a man clad in coattails and a Beethoven-esque powdered wig, whom frontman Jim James cheekily identified only as Dr. Frederick von Guggenheim, “conducted” the whole set. Later in the afternoon, Seattle indie rockers Modest Mouse, perhaps the most un-Bonnaroo performers of the weekend, headlined on the festival’s second stage. The band’s jerky, abrasive rock, led by frontman Isaac Brock’s neurotic swagger, was certainly a change of pace from the festival’s good-times, good-jams atmosphere. 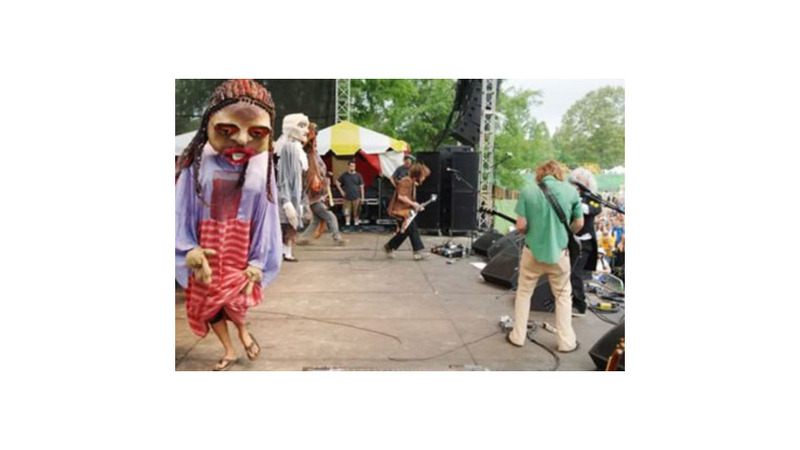 While Modest Mouse cut its teeth at drunken dive-bar gigs, most of the Bonnaroo artists seemingly had their inception as a consequence of passing the peace pipe a few too many times at a drum circle in a Vermont state park. All the same, early in the set, as the band cut into its inescapable single, “Float On,” the hordes appeared receptive. However, as Modest Mouse dug deeper into its repertoire, pulling out songs like “Tiny Cities Made of Ashes” and “Doin’ the Cockroach” from 1997’s The Lonesome Crowded West, the band sent the hippies scrambling into the trees, literally. Before the set’s end, almost two dozen (most likely drug-zonked) concertgoers had shimmied up the trunks of several towering trees near the stage’s sound booth, climbing to stupidly dangerous heights and dancing amidst the branches. Luckily, no one fell to their death. While main-stage headliners Widespread Panic closed out the weekend, the Paste staff was busy trudging through the mud, lugging box after lumbering box of our namesake rag into vehicles of all varieties. Even so, nearly four hours later, as we were packing up the last of our gear, we still heard the Athens natives playing away. Their set included a pair of Talking Heads covers (“Heaven” and “Life During Wartime”), as well as surprise appearances from Herbie Hancock, Bob Weir, Robert Randolph and Col. Bruce Hampton. With our eyes on the clock (and ears on Panic’s never-ending drum solo), we scrambled into our rides and headed back toward Atlanta, making sure to beat the Bonnaroo mass exodus.